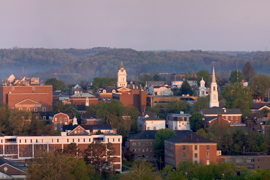 Athens, Ohio, is a small town in southeast Ohio with 3,000 permanent residents, and is home to Ohio University. Athens was a city with no design guidelines of any kind, and partnered with Designing Local and MKSK to help the community create a locally "Essence of Athens" inspired design culture. The Awards Committee was incredibly impressed with this plan, and felt it embodies the best of small town planning. The project was selected for an award due to its innovative approach to creating a uniquely Athens esthetic and design language. The plan is user-friendly and highlights efforts everyone in the community (not just the development community) can do to implement Athens-based design. The plan's unique design encourages people to use it, draw in it, and remember to always put Athens-based design first. The stakeholder engagement process was clearly targeted to ensure representation of all members of the community. STaR is excited to share this plan with other communities as an example of how to build on unique community assents and employ community-based design as an economic development tool. Adams County is a rapidly growing county on the outskirts of Denver. It has a rich agricultural tradition, and sought to preserve that tradition, as well as connect the more urbanized areas of the county to its rural roots. The plan provides a good example of how rural character can be preserved in the face of rapid urbanization. The project was selected for an award due to its forward thinking and innovative approach to preserving natural areas and connecting urban areas with more rural areas of the county. The plan strikes a balance between different urban and rural community values, and adapts the open space and parks program to the present and future needs of the changing population. STaR is excited to share this plan with other communities as an example of how rural communities can identify corridors and other protectable areas that will preserve their agricultural heritage. Recognizing the tremendous opportunity for growth in Huntsville presented by the expanding Houston Metro area, H-GAC partnered with the City of Huntsville and the Design Workshop team in completing a study that would better position the city for housing and economic improvements. The case study provides local officials and citizens with a clear framework for implementing projects that strategically build upon and strengthen quality of life in Huntsville. The primary goal of the case study was to foster the development of strong, stable neighborhoods within the City of Huntsville while tying this effort to positive branding and the promotion of expanding businesses and development within the city. This project was chosen for a Merit Award because of its unique case study approach. The committee was impressed with the breadth of strategies outlined in the plan, as well as the extensive business involvement. The plan is well laid-out and the images help make the plan user-friendly. University of Texas — Arlington Institute of Urban Studies, Project Lead — Julie Wyatt, Project team — Cristine Baril, Jungsoo Kim, Yanikka Lemons, Kukhyoung Kim, and Glenn Showers. 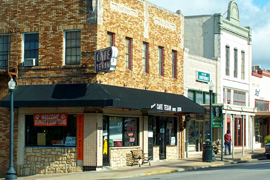 The City of Palestine, Texas, contracted with the Institute of Urban Studies at the University of Texas at Arlington beginning December 2013. A team of seven graduate students with the Institute led a public input process which included a public survey, numerous stakeholder interviews, and "hands on" public meetings to help the community develop a creative and achievable comprehensive plan. The Awards Committee was impressed with the professionalism of the plan and the planning process. The plan not only includes extensive analysis, but is based on broad citizen input, something that is not often seen in student projects. The document is well organized, and includes helpful graphics, making the document appealing to a wide audience. 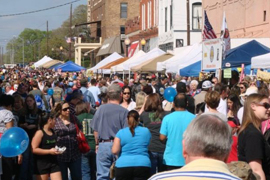 This plan demonstrates that students can play an important role in planning for small towns. Newton County 2050 Plan, Newton County, Georgia, Newton County Leadership Collaborative and Center for Community Preservation & Planning. Village of Lake Isabella Master Plan, Lake Isabella, Michigan. New Braunfels Stormwater Management Strategy, New Braunfels, Texas, City of New Braunfels and Design Workshop, Inc. consultants. Yankeetown – Inglis Adaptive Design: Strategies for Adapting to Coastal Change, University of Florida-Gainesville Dept of Urban and Regional Planning, principal investigator Dr. Kathryn Frank, project manager Michael Volk, students Sean Reiss, Rong Zeng, Jana Rosenbloom, and Kevin Bennett. Nathan Johnson, Pine City, Minnesota. Pavilion Marketplace Redevelopment Plan, Rothschild, Wisconsin, Village of Rothschild and MSA Professional Services, consultants. Mosinee Downtown Development Plan, Mosinee, Wisconsin, Mosinee Area Economic Development Committee and North Central Wisconsin Regional Planning Commission. Downtown Development Guide, Opelika, Alabama, City of Opelika and City Planner Jerry Kelley. clearzoning® Ordinance, City of Lathrup Village, Michigan, and Clearzoning, Inc., consultants. Luna Pier Master Plan, Luna, Michigan, Luna Planning Commission and Monroe County Planning Department. City of Grinnell, Iowa, Public-private partnerships. Baptist Master Plan, Greenwood, MS, Mississippi State University. Philip Chester, AICP, Town of Lebanon, Connecticut. Outstanding Planning Initiative, (John Keller Award) given to an outstanding initiative or program in public education, workshops, ordinances, or enforcement that promotes planning in small towns and rural areas was awarded to Grinnell, Iowa (population 9,106) and Russ Behrens, City Manager, for their public‐private partnerships. Outstanding Small Town and Rural Planner, (Carol Thomas Award) given to an individual in public service, academia or the private sector that has made an outstanding contribution to planning in their community, was awarded to Philip Chester, AICP of the Town of Lebanon, Connecticut (population 7,400). Outstanding Student Project, (James Segedy Award) given to an outstanding project by a graduate or undergraduate class or individual that addresses a planning issue facing small town or rural areas, was awarded for the Baptist Master Plan in Greenwood, Mississippi prepared by students at Mississippi State University. Award) given to an outstanding comprehensive plan or special project plan that addresses the development of a neighborhood, community, county or region was awarded to the Luna Pier Michigan Master Plan (population 1,400) prepared as a partnership effort by Randy Mielnik, AICP of Poggemeyer Design Group along with Tad Krear of Land Design Studio, the Luna Pier Planning Commission, Luna Pier City Administrator, and the Monroe County, Michigan Planning Department. The Vernon Deines Award for Outstanding Small Town or Rural Plan is given to an outstanding comprehensive plan or special project plan. This year's recipient was the Harrison County, Mississippi for its 2030 Comprehensive Plan, which was prepared with assistance from Jennifer Evans-Crowley, AICP, Ohio State University Austin E. Knowlton School of Architecture. The jury was impressed by the Plan's overall quality, innovation, transferability and use of smart growth principles. The John Keller Award for Outstanding Planning Initiative for a Small Town or Rural Area was given to Town of Williston, Vermont for its Williston Growth Center, which was prepared with assistance from Lee Nellis, AICP. The plan was a smart growth project. The jury was impressed by its innovative approach and its transferability to other areas facing the same issues. The James A. Segedy Award for an Outstanding Student Project was given to the Virginia Tech Urban Affairs and Planning Graduate Land Use Planning Students for its Implementing the Village Plans: Best Practices and Recommendations for Zoning Virginia. The students were led by Professor Diane Zahm, Student Advisor. The Carol Thomas Award for Outstanding Small Town or Rural Planner was given to J. Michael Gurnee, AICP, of Dodge City, Kansas for assisting other small town planners, serving as a mentor, and for helping the City of Greensburg, Kansas through its disaster recovery phase and into the rebuilding phase as a sustainable community. The Vernon Deines Award for Outstanding Small Town or Rural Plan is given to an outstanding comprehensive plan or special project plan. 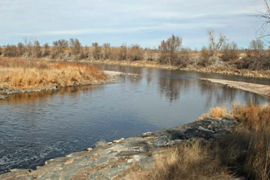 This year's recipient is the Town of Avon, Colorado, for the Avon Comprehensive Plan. The John Keller Award for Outstanding Planning Initiative for a Small Town or Rural Area is given to the Town of Moreland, Georgia, for its Community Outreach efforts for the 2006-2026 Comprehensive Plan. The James A. Segedy Award for an Outstanding Student Project was given to Ohio State University for its Community Plan for Eastern Harrison County, Mississippi, completed by CRP 852 students Joshua Anderson, Ian Beniston, Ma'ayan Citron, Nathan Leppo, Bridget Troy, Erica Wicks, and Rickie Yeager. The Vernon Deines Award for Outstanding Small Town or Rural Plan is given to an outstanding comprehensive plan or special project plan. This year's recipient was the City of Adrian, Michigan for its 2006 Comprehensive Plan, which was prepared with assistance from Birchler Arroyo Associates, Inc. The jury was impressed by the Plan's overall quality, innovation, transferability and use of smart growth principles. The John Keller Award for Outstanding Planning Initiative for a Small Town or Rural Area was given to Oliver Township, Michigan for its Utility Grid Wind Energy Exclusion Zone, which was prepared with assistance from the Spicer Group. The plan seeks to balance the competing interests of expanding wind energy while protecting agricultural lands and natural resources. The jury was impressed by its innovative approach and its transferability to other areas facing the same issues. The James A. Segedy Award for an Outstanding Student Project was given to Ohio State University for it Pineville, Mississippi Community Plan. The students, led by Professor Jennifer Evans-Cowley, assisted Pineville in its first planning effort to incorporate citizen input, and this following the devastation of Hurricane Katrina. The students were able to convey planning concepts in laymen's terms and encouraged smart growth and LEED concepts to the rural community. The Carol Thomas Award for Outstanding Small Town or Rural Planner was given to Professor William J. Kelley of Eastern State University for his role in assisting small towns in the Pacific Northwest while developing future planners to serve in these same communities and others.